Raoul Walsh's THE LAWLESS BREED is a disaster movie of a Western, spending 83 minutes careening from one tragedy or bad decision to another as it tells the story of gambler-outlaw John Wesley Hardin (Rock Hudson). Although the movie is colorful and has its strong points, including a spirited performance by Julia (Julie) Adams as a saloon girl who loves Hardin, it suffers from a cliched script and an exasperating lead character. It simply wasn't very enjoyable watching Hardin be in nothing but trouble for most of the movie. Hudson is fine, but it's not an appealing role. John McIntire gives two performances in the film; he's way over the top as Hardin's fire-and-brimstone preacher father -- and saddled with some awful dialogue -- but enjoyable as Hardin's kindly uncle. It's fun to see Dennis Weaver as Hardin's cousin. The bad guys include Hugh O'Brian, Lee Van Cleef, and Michael Ansara. Mary Castle plays Hardin's sweetheart; I wasn't familiar with her but learned from IMDb that she appeared in Westerns opposite Audie Murphy, Gene Autry, and Charles Starrett. The movie takes every opportunity it can to show Julie Adams as underdressed as possible, another thing which made me roll my eyes a bit. That said, her performance is the most interesting thing in the movie. Rock Hudson and Julie Adams previously costarred with James Stewart in BEND OF THE RIVER (1952), reviewed here. As I shared in that post, when I was a teen I had the honor of appearing in a bit part in a local stage production of THE PRIME OF MISS JEAN BRODIE which starred Miss Adams. She was a lovely lady. A side note: When I reviewed Walsh's CHEYENNE (1947) last weekend I noted that I felt Leonard Maltin had underrated that film at just two stars. Ironically, Maltin rated THE LAWLESS BREED three stars. I would exactly flip those ratings, giving CHEYENNE three stars and THE LAWLESS BREED two. 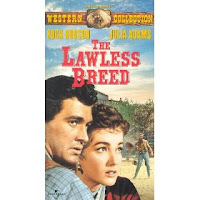 THE LAWLESS BREED is on DVD as part of the Classic Western Roundup, Vol. I, along with CANYON PASSAGE (a good Dana Andrews-Susan Hayward movie), Audie Murphy's THE KANSAS RAIDERS, and THE TEXAS RANGERS starring Fred MacMurray. The DVD print is excellent. The only extra is a trailer. It's also available on video. Other Raoul Walsh movies previously reviewed here: BIG BROWN EYES (1936), THEY DRIVE BY NIGHT (1941), and THE MAN I LOVE (1947). 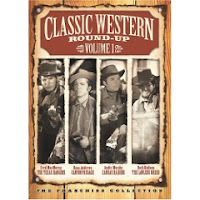 August 2009 Update: Here's a review of another movie in the Classic Western Roundup set, THE TEXAS RANGERS. What a neat experience for you as a young person to have taken part in a stage play with professionals in the cast, such as Julie Adams. It really was wonderful -- the more so as I was a big film buff even then, plus she had guest-starred in episodes of my favorite TV series, MAVERICK, which aired in reruns every afternoon during that period of time. Julie Adams was wonderful in The Creature from the Lagoon -- and in the real world she was smart and interesting. But Rock as John Wesley Hardin. What were they thinking? ?